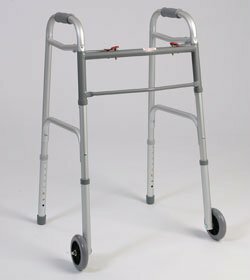 Walking Aid - 1 inch Tubbing, Dual Button folding walker, With 5 inch wheels Weight capacity of 250 lb. Walking Aid - 1 inch Tubbing, Dual Button folding walker, With 5 inch wheels Weight capacity of 250 lb. Comes with Glide Caps.